Siddhant Chaturvedi shot to fame as M.C. Sher in Gully Boy. This 25-year-old actor made his Bollywood debut alongside Ranveer Singh in the recently released, Gully Boy. Siddhant who essayed the role of a street rapper in the film, was applauded for his impeccable performance in the film. In fact, veteran actor Amitabh Bachchan also sent the actor a hand-written letter, appreciating his work. Siddhant was recently in Hyderabad for an event. It was then when the actor revealed he is a die-hard fan of Tollywood star Allu Arjun and he wishes to meet him at least once. Siddhant Chaturvedi Says True MC Sher is His Father, Gully Boy Actor Opens Up to Humans of Bombay. 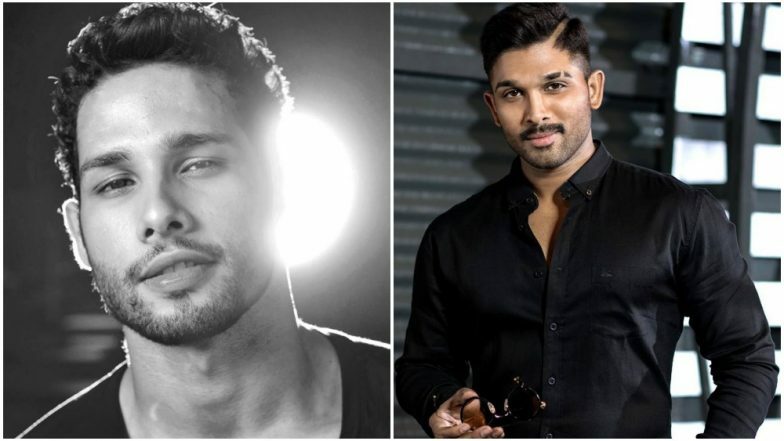 Siddhant Chaturvedi amazed the crowd present at the event with his performance and when he revealed that he is a huge fan of Allu Arjun, fans couldn’t stop gushing about it. In fact Siddhant performed to Allu Arjun’s popular dance numbers, as a tribute to the superstar. While speaking to a local news channel Siddhant said, “I was in college and the first film I saw was Allu Arjun’s Arya. I was blown away by his performance and then watched his dance videos - Top Lessi, Lover Also and Blockbuster. And I love the way he’s got the swag and the moves. He’s a style icon and he’s amazing.” Allu Arjun’s Film With AR Murugadoss Unlikely to Happen? Besides Gully Boy, Siddhant Chaturvedi was also featured in youth sitcom Life Sahi Hai and the web series Inside Edge. One thing is clear, Siddhant is a huge fan of Allu Arjun and he is waiting for the opportunity to meet the superstar at least once. Will Siddhant get the chance to meet his favourite star, Allu Arjun? Let’s wait and watch what is in store for the young actor.